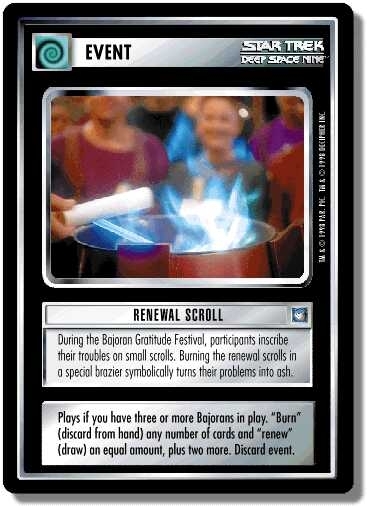 During the Bajoran Gratitude Festival, participants inscribe their troubles on small scrolls. Burning the renewal scrolls in a special brazier symbolically turns their problems into ash. Plays if you have three or more Bajorans in play. "Burn" (discard from hand) any number of cards and "renew" (draw) an equal amount, plus two more. Discard event. There are 15 entries for Renewal Scroll (ST1E 5 U 71) at the Tradeplace (36 haves and 5 wants). Click here to see all trade list entries for this Uncommon card! Also see here for all trade lists with any card fom "Deep Space Nine".